while Bud Fensterwald (center) and J. Gary Shaw (right) look on. 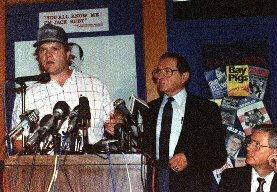 On August 6th 1990 the JFK Assassination Information Center located in the West End of Dallas, Texas held a press conference. At that conference it was revealed that deceased former Dallas police officer Roscoe Anthony White was a member of a three man hit team. Roscoe's son, Ricky Don White, announced that his father, using the code name Mandarin, was the "grassy knoll assassin." Additionally, he claimed his mother had worked for Jack Ruby and his father was forced to shoot fellow police officer and friend, J.D. Tippit. What follows are quotes made by various press conference participants along with the position of the Texas Attorney General, Dan Morales. After ten years which have stood the test of time and which ring hollow? "We've gone out and verified as much of his story as private citizens can. . .The information is quite important and we think it's true. . .We think the story is complete, we think it is correct. If it is a hoax, it is one of the most elaborate and senseless hoaxes that's ever been perpetrated. We don't think it is, but we certainly leave open that possibility." "What if this is some elaborate hoax perpetrated by some other individual. . .it could be something like that. . .and if this is a hoax, at least we're trusting it to the American people to make that decision. . .When Ricky White came, I was very skeptical. I believed Ricky White was telling me the truth about what he had seen and heard and knew. I hope you realize that that's what he's doing." "The fact is, Roscoe White was a professional assassin." "Seventeen months of searching for the truth, the whole truth, and nothing but the truth. The evidence that I've gathered concludes beyond any reasonable doubt that there was a firing squad in Dealey Plaza on November the 22nd, 1963. Beyond a reasonable doubt that Roscoe Anthony White was one of the members of that firing squad." "He spilled his guts that night, he told her (Geneva White) everything. There are a lot of other events that I'm very privy to, I have many hours of tapes that are locked in a vault and are safe, I've got affidavits, and I'm here to tell you that there's a lot of stuff that'd blow your mind." Larry Howard appeared but made no statement. "I think the greatest significance of what we've found here is the fact that if all of this checks out, if we have scientific analysis of all the documents and every element of the story, we've checked it as far as we possibly can, and it checks so far to us or we wouldn't be here today." "I believe that I'm just as honest as any person sitting in this room. I would not be standing here telling you a story that has all the corroboration to it and all the incidences to it. If I was standing up here telling you a story and I didn't have anything, you could doubt me." "So far, everything we have looked at has not given any credibility to anything these people have been trying to say about the documents and that whole affair." The quote below may be the most relevant of all. In the following weeks I intend to review other activities by the parties at interest to this "story." September 4, 1990 ~ Ricky White appears before Jim Marr's Kennedy advanced study group.